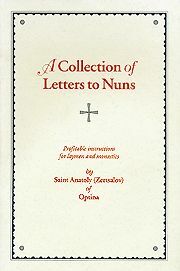 St Anatoly’s letters teach the knowledge and love of God; they clarify the lofty goal of the Christian and the monastic life; they provide encouragement in the struggle of battling against passions and weaknesses; they teach the Prayer of Jesus; and in general they contain many useful lessons for anyone seeking the spiritual life. Softbound. 308 pp.